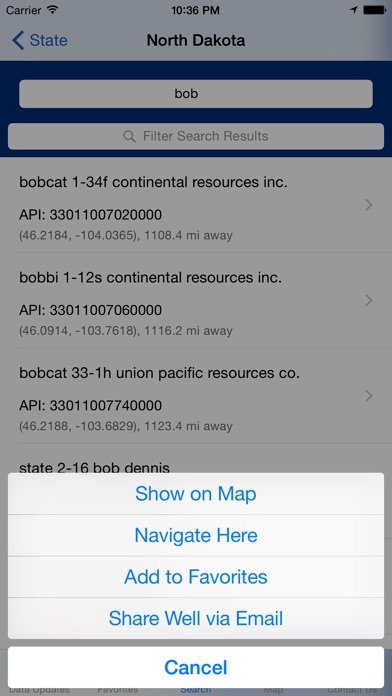 Wellsite Navigator Unlimited allows users to Search, Map, and Route to well sites in the United States. The Wellsite Navigator Unlimited version contains all functionality that is in the Wellsite Navigator USA version ($19.99) with one big PLUS! 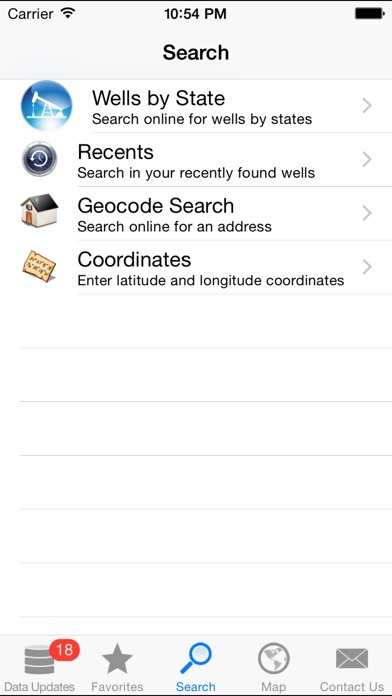 All well updates that are made available by SiteFinder GPS can be accessed by users of this App at no additional charge. 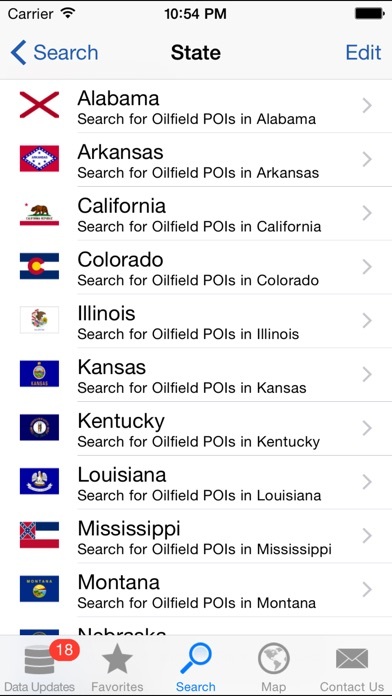 With the Wellsite Navigator USA App ($19.99), users are required to purchase a monthly data subscription to gain access to the monthly well updates. With Wellsite Navigator Unlimited, ALL well site updates are included at NO ADDITIONAL CHARGE! Now available (via in-app purchase) is our NEW Show Wells feature. Customers are now able to use this additional feature to display all wells on the mapping within a specific geographical region. 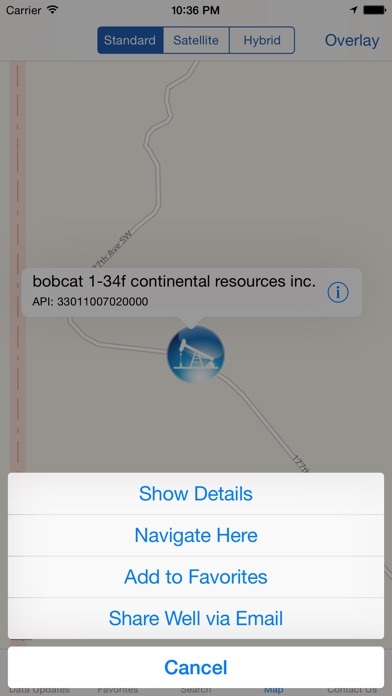 This feature also provides you with the ability to route to all wells that are displayed on the mapping. The following states are included in the application: Texas, North Dakota, California, Arkansas, Utah, Wyoming, Alabama, Colorado, Mississippi, Montana, Nebraska, Nevada, Kansas, Kentucky, Louisiana, Pennsylvania, Illinois, New Mexico, Oklahoma, South Dakota, West Virginia and Ohio. Please contact us if you don't see your desired state on the list. Users can save favorites and view recently searched well sites as well as export their Favorites list along with 'Share' (email) well site information with a friend. 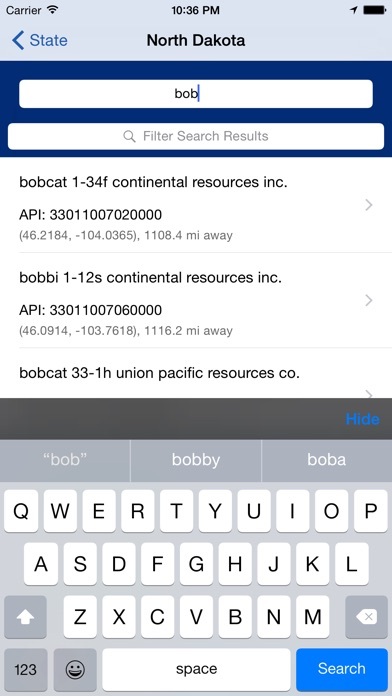 We are continuously looking for ways to enhance this very popular navigation app. Please feel free to provide your comments regarding how we can make the Wellsite Navigator Unlimited App even more useful! We work diligently to provide as complete and up to date a product as possible however we are limited by data that is available for each State. Completeness of data varies by State. I’ve been using this app for a while I have been very impressed with it. The latest update however is making the map very blurry. I paid for the "unlimited" version so I wouldn't have to pay for additional features or updates. Why do I need to pay an additional $9.99 for a feature to save my wells instead of clearing them every 30 min-1 hour like it does now? This feature should be standard, not a way to gouge your customers! I use this app all the time but I become extremely frustrated when I go back to look at all the wells I spent time searching for are gone and I have to search them again. I absolutely love this application. I rely heavily on it everyday. But since I've updated to the ISO 8.2 it will not allow me to search. I paid $50.00 for the unlimited version. I would great appreciate if you guys would fix the current problem. Thanks! Updated to 8.2 on iPhone and now app stopped working won't search! please update asap I rely heavily on this app to navigate around. Other than this issue it had been working fine!